Share your passion for wild birds with a Bird Watching magazine subscription. Each issue of Bird Watching magazine, is dedicated to bringing you everything you need to know on birdwatching. Packed full of stunning photography and advice every month. Bird Watching magazine will inform and inspire you for the month ahead, with advice on how to get the most from your birding, whether you're a beginner, an improver or an expert. We'll tell you what's been seen, reveal some fabulous bird walks, and entertain you with some of the world's best photography. We'll inspire you with brilliant photography, exciting locations, expert product tests, informative identification guides and all the latest sightings. Just add binoculars for your ultimate birdwatching experience. 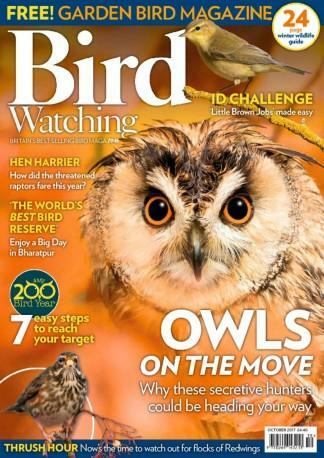 Each issue of Bird Watching Magazine is packed with features including: - Practical advice on getting more from your hobby. - Indispensable identification guides on difficult species. - Inspirational bird photography from the world's best photographers. - 10 easy walks with a great chance of seeing exciting birds. - News and reviews of all the latest birdwatching products. - Rare sightings from all across the country. - Thought provoking features from world-renowned experts. Be the first person to tell us what you think about Bird Watching (UK) and you'll save $5 on your next purchase!